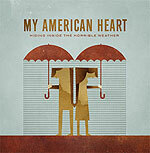 CD review: "Hiding Inside the Horrible Weather"
This review first appeared in Turbula in September 2007. Nominated for best rock band in the upcoming San Diego Music Awards, My American Heart's latest CD shows they're already outgrowing the local music scene. On their second album, the band seamlessly blends edgy new-century alternative sounds with the self-confident posturing of classic arena rock. Add in the glossy patina of a well-crafted pop song, and you've got this region's latest winning formula for national success. Lead singer Larry Soliman's unmistakeable vocals combine with the muscular twin guitar approach of Jesse Barrera and Matthew VanGasbec to create a sound that is both consistent and identifiable across the 11 tracks on their second album. And it's those 11 songs that make this album succeed so very well. From the opening anthem, "Boys! Grab Your Guns" through the surging power pop of "Speak Low If You Speak Love" to the seductive refrains of "The Shake (Awful Feeling)," the album opens about as strongly as one could imagine. Those are three potential national hits right there. The rest of the album isn't as radio-friendly, but even more interesting. Soliman is a remarkably assured young singer, equally confident and at home on the power rockers and the slower, more stripped-down ballads. He also knows how to sing in front of a band, immersing his delivery into the music. With pleasantly melodic songs, complex arrangements that lend their songs richness and depth, and the sort of rock 'n' roll confidence that borders on cockiness, My American Heart is ready for the national stage.